Wipaq provides for the needs of the differently-abled section of the market with its security gates SG400 model which operates on the electromagnetic mechanism to open the gate. It is compact, sleek and stylish and can be a great addition to a security check spot in any establishment especially a public one. The SG 400 ADA access control Security Gate is constructed from 2" OD satin finished type 304 stainless steel tubing. The hinge post and stop post are both welded to a 1/4" thick 6" diameter flange plate. Each flange plate is covered with a decorative brushed stainless steel flange cover. The SG 400 comes standard with two welded 1" diameter pickets and hangs on two heavy-duty self-closing hinges. The standard clear opening is 40". Compare the quality, standard options, and thick-wall construction and you will see that the SG 400 is the best valued Security Gate available. The SG400 ADA access control Security Gate comes standard with the following: self-closing hinges, satin stainless steel finish, two pickets, stop plate, and stainless steel flange covers for both post flanges. The SG 400 Security Gate may be ordered in a variety of different configurations. Please call for details. The SG 400 Security Gate may be ordered as a manually closing gate. The SG 400 access control Security Gate is available with an electromagnetic lock which is powered by 12/24VDC. This allows for the use of a card reader or other types of ID devices. 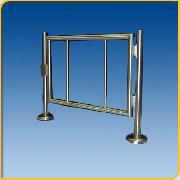 The SG 400 Security Gate may be ordered in other materials and finishes. Please call for details. The SG 400 access control Security Gate may be ordered in custom sizes and configurations. Please call with details for a quote.